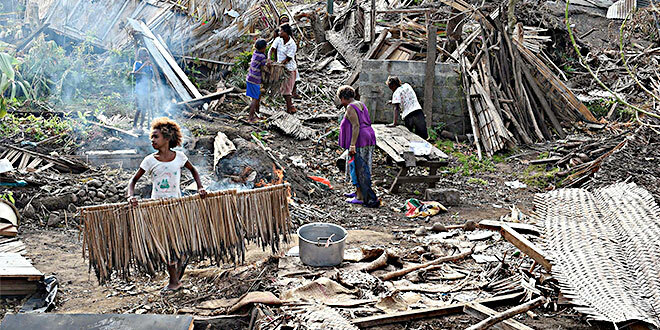 UNREQUESTED donations given to Pacific neighbours after disasters may cause more harm than good, a report commissioned by the Australian Red Cross has found. It’s the first research of its kind examining the often-huge financial burden of having to dispose of unwanted goods sent by well-meaning Australians. Fiji received 133 containers and more than 8000 pieces of loose cargo, the equivalent of 33 Olympic swimming pools worth of donated junk, after Cyclone Winston hit last year. Sports gear, chainsaws, carpets and woolly jumpers were among the unwanted items sent. The new Red Cross report highlights how unsolicited goods are hindering disaster relief efforts and often end up in landfill. Vanuatu was also inundated with unsolicited donations such as high heels, handbags, heavy blankets and canned food in more than 70 shipping containers after Cyclone Pam in 2015. Ten months on from the disaster, 18 containers remained uncollected and had accumulated $2 million in storage fees. More than half the canned food items had expired. Australian Red Cross disaster and crisis response manager Steve Ray said the mismatch between what was needed and what was sent hindered disaster relief efforts. “People who donate goods often send whatever they have on hand,” he said. Mr Ray said the unsolicited goods often end up clogging up space at airports and docks. “Customs officials and relief agencies then have to sort, catalogue and assess these items, which takes time away from helping the people most affected,” he said. Aid groups are hoping to divert the generosity of Australians to cash donations instead because they say it’s a more effective way to help those most in need. Australian Council for International Development Policy and Advocacy head Joanna Pradela said people’s well-meaning actions were doing more harm than good. The Red Cross report acknowledged humanitarian agencies had to do more to build community trust that donated money would be used in an effective and timely manner. The ACFID website includes up-to-date lists of trusted aid and humanitarian organisations, including Caritas Australia and Catholic religious orders, working in disaster-affected countries.